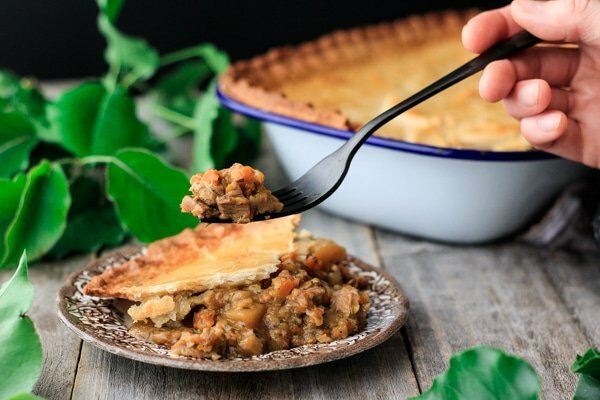 Learn how to make Irish dingle pie with this comfort food dinner recipe. This hearty pie is packed with root veggies and leftover roasted lamb—all baked under a beautiful golden crust of hot water pastry. Splurge and enjoy a slice of Ireland with this hearty pie on St. Patrick’s Day or throughout the year. 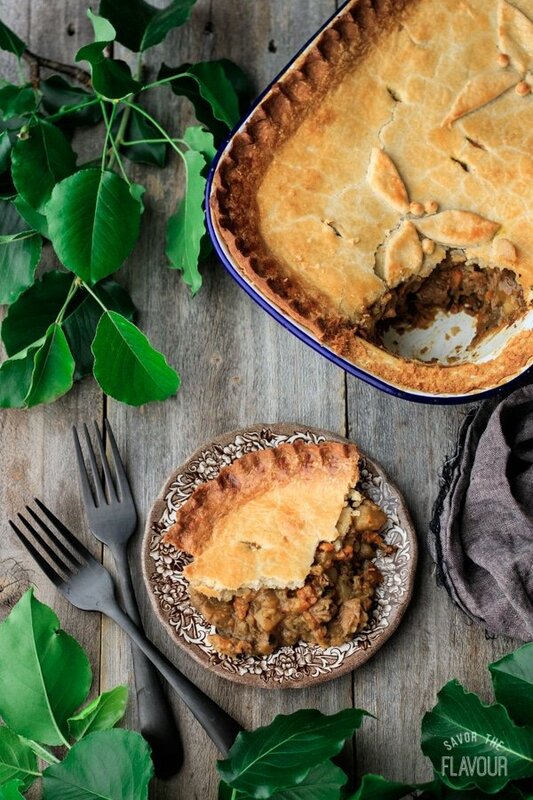 The pleasure of a 5-star review for this dingle pie recipe would be greatly appreciated. Often, dingle pie was made in individual portions, similar to a Cornish pasty, and eaten for lunch by shepherds, farmers, and fishermen in the area. 👨‍🌾 It is still popular today at fairs and on holidays. It’s easy to see that this meat-and-veg filled pie would make a fabulous lunch for a hungry workman! 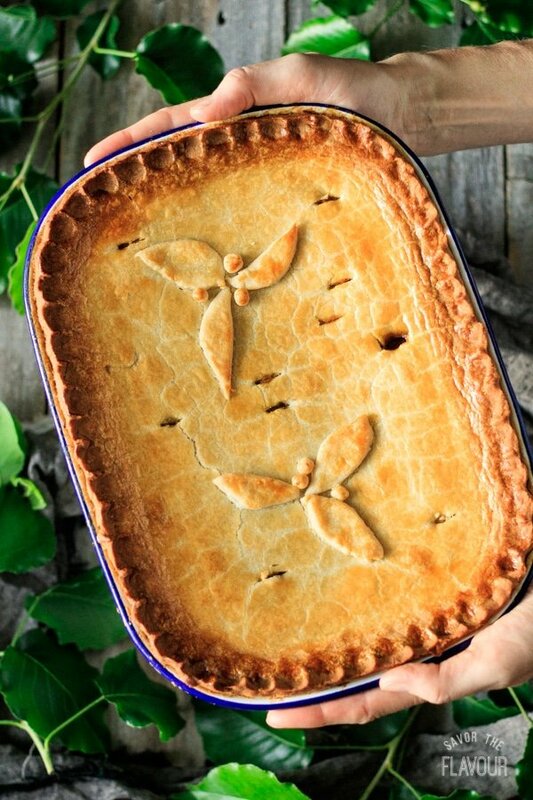 Since these dingle pies would be carried as portable lunches, bakers would use hot water crust pastry instead of a more delicate shortcrust or flaky pastry. Fortunately, hot water crust is super easy to make, and doesn’t require any chilling time at all. To make an authentic dingle pie, use mutton fat in the pastry instead. Taste the filling as it cooks and adjust the seasonings as desired. Pressed for time? Make the filling ahead and refrigerate until you’re ready to make the pie. You can even freeze the filling in a zip-top freezer bag. Don’t cheat and use store-bought pastry. Hot water crust is ridiculously easy to make, and its flavor and texture can’t be substituted. Use the hot water crust pastry while it’s still warm. Keep it in a bowl set over a saucepan of simmering water to keep it hot. Leftover dingle pie will keep in the fridge for up to a week. Looking for other delicious savory pies? Your family will enjoy these ones! 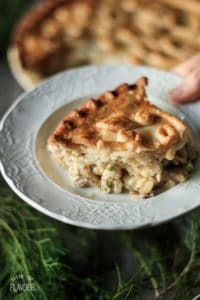 Creamy Chicken and Mushroom Pie: a British classic comfort food everyone should know how to make. 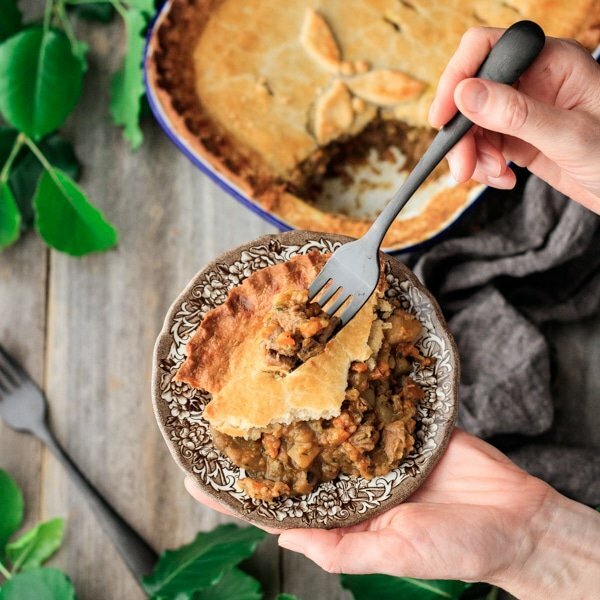 Chickpea, Spinach, and Mushroom Pie: a colorful, aromatic filling with a spectacular rough puff pastry top. Cheesy Ham & Potato Pie: leftover ham, potatoes, and cheese sauce is baked under a beautiful cheese pastry. Finely chop the onions, carrots, and parsnips and cube the roasted lamb. Melt the butter in a Dutch oven over medium heat, then saute the onions until soft. Add the carrots and parsnips and saute for a couple minutes longer. Stir in the flour and cook for a minute or two, then pour in the lamb drippings and beef stock and stir to combine. Let the mixture simmer while you peel and cube the potatoes, then add them and the cubed lamb to the mixture. Mince the fresh parsley and chop the thyme leaves. Season the lamb filling with the fresh herbs, Worcestershire sauce, and freshly ground black pepper. Let the filling simmer over low heat for 20-30 minutes to allow the flavors to blend and the potatoes to cook until fork tender. Spoon the cooked filling into a 6-cup (1.5 liter) enamel pie dish and set aside to cool slightly as you make the pastry. In a small saucepan, heat the water and lard until the water is just boiling and the lard has melted. While the water is heating, sift the flour and salt into a medium mixing bowl. Once the water is boiling, immediately pour it into the flour mixture and stir until thoroughly combined. Turn the dough onto a clean work surface and knead briefly until smooth. Allow the pastry to cool for a minute or two before rolling out, but don’t let it get completely cold, or it will not be workable. Brush the rim of the pie dish with beaten egg, then roll out the pastry until it’s large enough to cover the dish. Lay the pastry lid on top, press the edges to seal, and trim off the excess pastry. Brush the whole pie with beaten egg and decorate with the leftover pastry. Cut several large vent holes in the top. Bake the lamb pie at 400 F for about 35 minutes, until the pastry is a rich golden brown. Check the pie occasionally as it bakes, since the pastry may puff up in places. If it does, open up one of the vent holes with the tip of a knife to release the steam buildup. Allow the pie to cool on a wire rack for 15 minutes before serving to allow the filling to set. The pleasure of a 5-star review of this dingle pie recipe would be greatly appreciated.